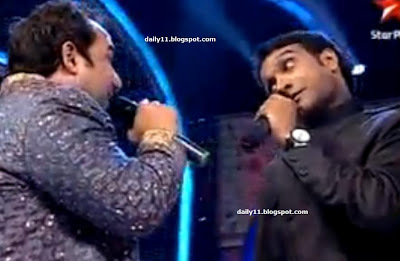 Master Saleem Khan,Rahat Fateh Ali Khan & Sonu Nigam at Star Plus Chhote Ustaad.umain30.com Has Collected The Greatest Moment Of Indian TV Show Chhote Ustaad.You Can Download All The Moments From Our Site.In what can be termed as a competition between the Indian and Pakistani music. One of the most talented and classically trained singers were one on one with each other at the Amul Chhote Ustaad program on Star Plus. What started as a mild jugalbandi between the Rahat and Saleem turned ugly in between with both of them trying hard to overshadow each other. And it won't be wrong to say the song they were singing became a noise between 1:58 to 2:05 in the video. But taking nothing away from their singing skills they gave tough competition to each other which no one other than these two could have managed. Sonu Nigam on the other hand remained a mute spectator in the fight of the titans. Rahat who carries forward the legacy of his uncle Ustaad Nusrat Fateh Ali Khan, Saleem is the son of Legendary sufi singer Ustaad Puran Shahkoti.Although it was a little awkward to hear such talented musicians creating such a fuss at some points in the song. But in the end it was the Music which Won.